Remember our disastrous family room from the day we moved in? The family room addition was one of the things that drew us to our new/old house but it was in rough shape aesthetically. 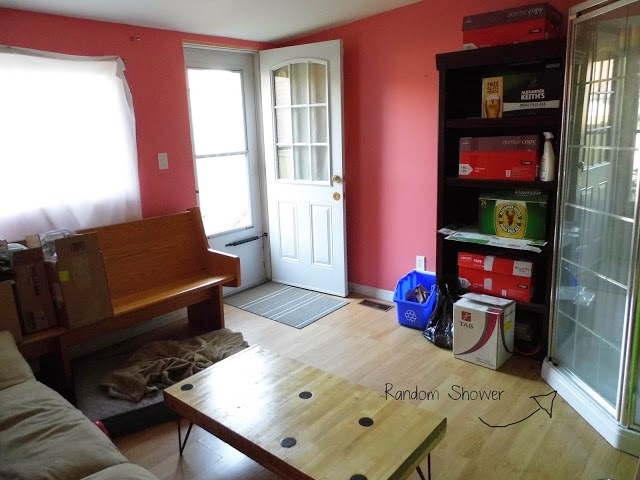 It was poorly insulated, had cheap laminate flooring, an exposed brick wall (it was an addition to the house) that someone had attempted to paint but had stopped after a few bricks, it was bright pink and it had a sketchy shower in the corner. One of the previous owners had mobility issues and we think this addition was built as a bedroom. The shower probably allowed her to avoid the stairs as much as possible. 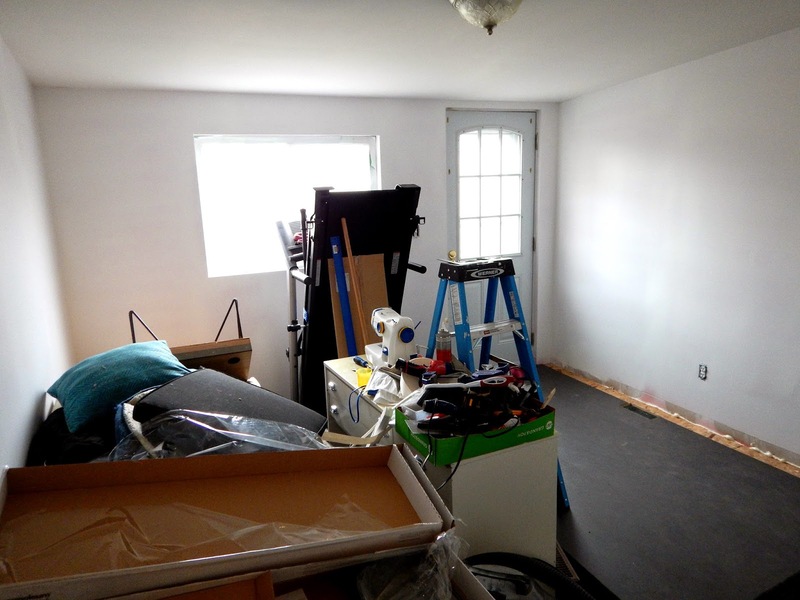 Initially, I hated the shower but during our bathroom reno, I was grateful for it and so we left it and the room remained untouched and just sort of became a dumping ground for overflow from the kitchen... until recently. Behind the shower is a (formerly) exterior window leading to the kitchen. It was finally time to fix the ugly pink blemish at the back of our house. 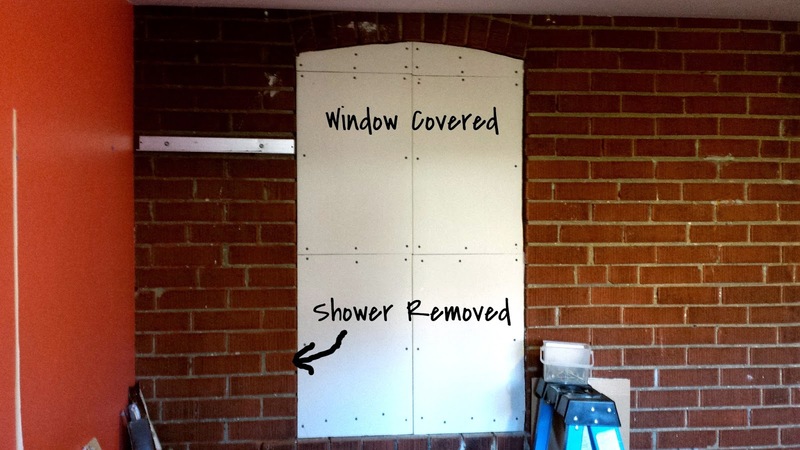 Corey removed the shower and framed and drywalled the window. 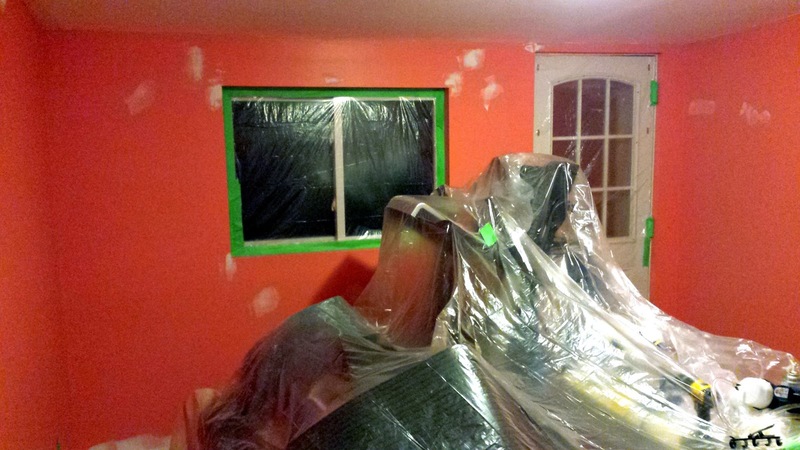 We knew the brick was going to be really challenging to paint, so he "Dextered" the room in plastic. He also removed the laminate and bought a paint sprayer to cover all the old brick. 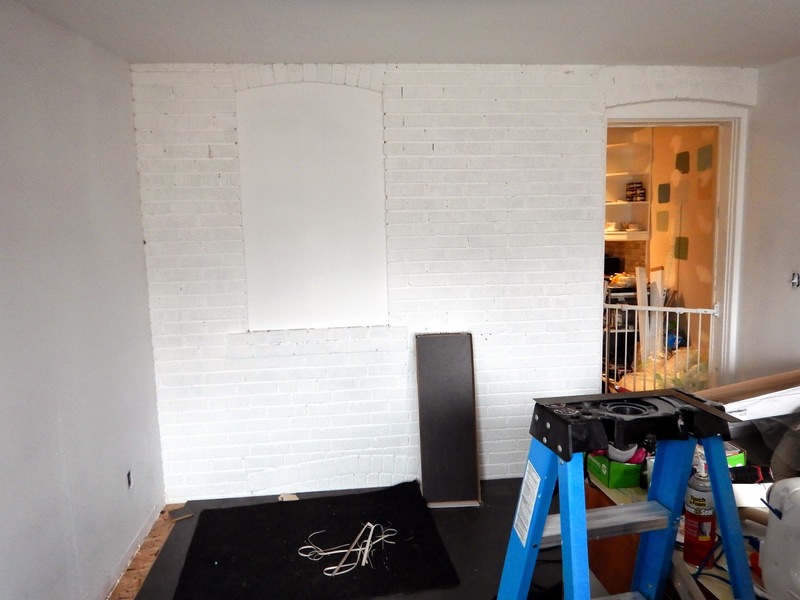 Yes, we would have left the exposed brick unpainted had it been in prettier condition and not already partially painted. He used the paint sprayer to prime the walls in white. We're going to continue our kitchen paint colour into the family room and we also wanted both rooms to have the same flooring. 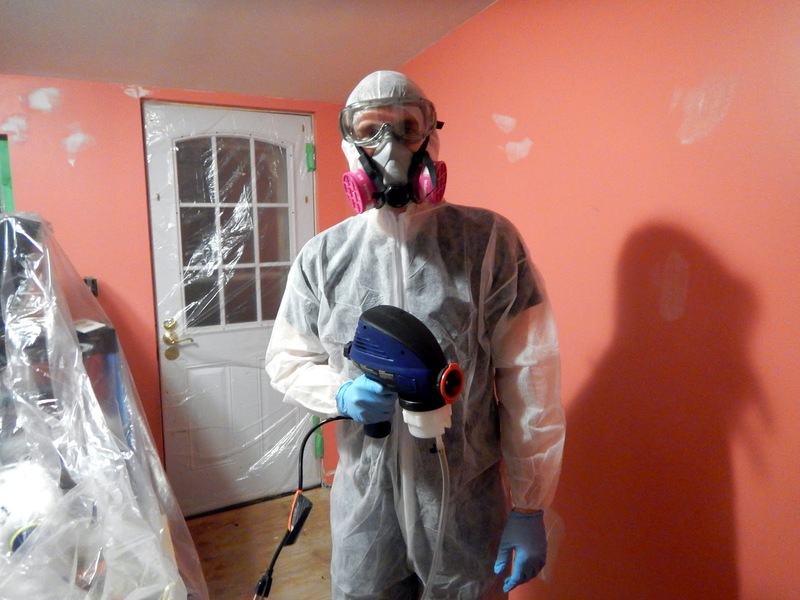 We knew the Marmoleum from the kitchen would provide some cushion and insulation but, even after Corey used spray foam around the edges of the walls, the room felt chilly. Our solution (thanks to a friend's recommendation) was to buy DriCore tiles, which are plastic on the bottom with a raised pattern. 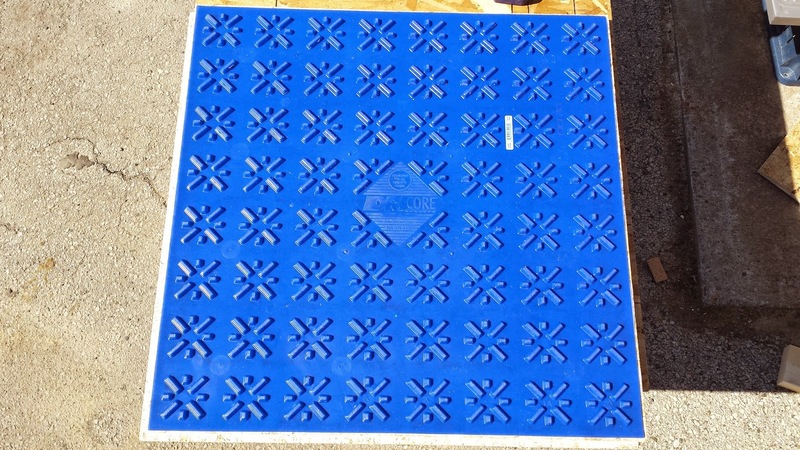 They're great for basements because the plastic side faces down and the air pockets serve to trap heat but also to provide a path for moisture to travel without ruining the floor. For our purposes, we liked the idea of an additional layer of insulation and we read that it would raise the temperature of the room by about 3 degrees Celcius. So Corey and my brother laid the DriCore under the Marmoleum and the unfinished room already looks so different! 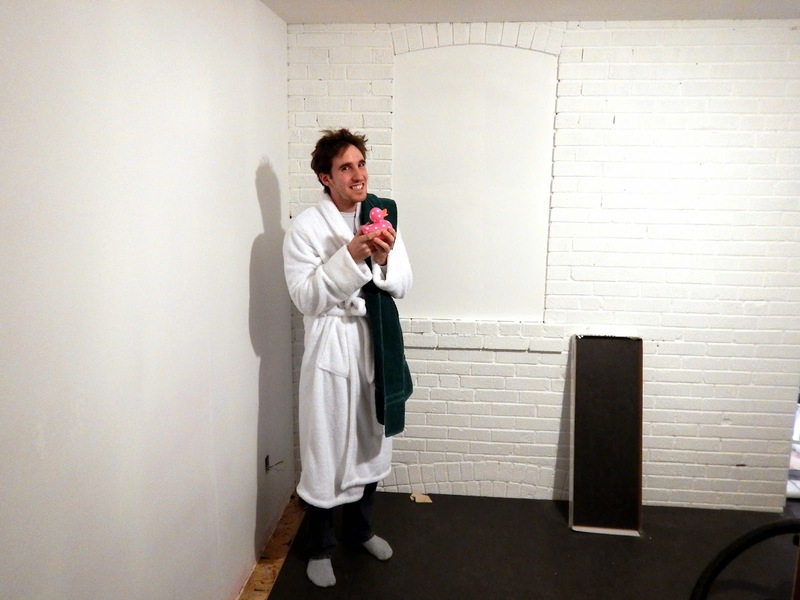 Here's Corey standing with a rubber duckey in the spot where we were showering last summer! Soon, we'll be ready to paint. 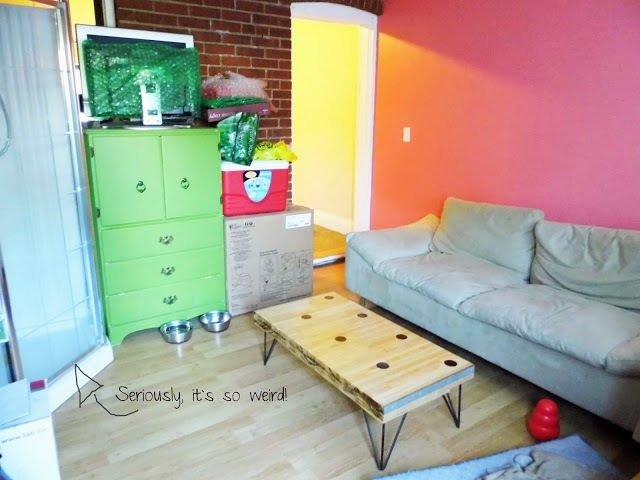 We have some fun ideas for this room!